The combination of extremely strong and sophisticated materials, together with Grivel's advanced technology lie behind the realisation of this crampon, which leaves all the other models on the market far behind. Ten points in contact with ice while you're walking and twelve that bite into the slope during traverses. The last two front points are Bi-angular to maintain bite when descending or traversing sideways. Even the soles of the most modern boots are perfectly covered. Designed for ski touring, competitive ski mountaineering, classical mountaineering routes and for high altitude or distant expeditions where weight is the determining factor. The model comes with the Flex bar, which allows the foot free movement without over stressing the crampon. New Classic binding system with bi-component strap giving maximum strength and maximum adherence. 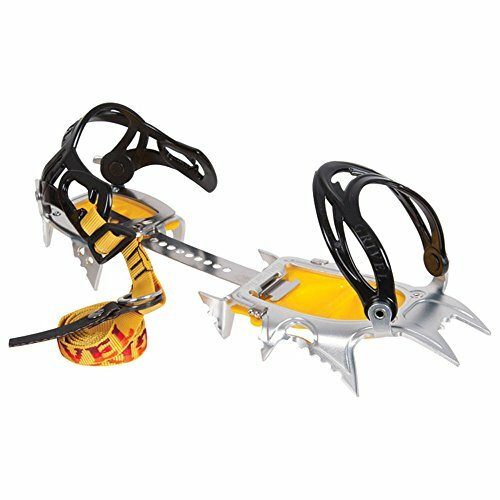 View More In Mountaineering & Ice Equipment. If you have any questions about this product by Grivel, contact us by completing and submitting the form below. If you are looking for a specif part number, please include it with your message.